Dior Homme has reference numbers printed inside most of its items. This number can be found on the fabric content label of the coats, jackets, suits, sweaters, and shirts. Most of (all of?) the jeans only have a reference number on the hang tag and not printed inside (at least none that I have ever found). In these examples you can see the location of the reference numbers (underlined in green). 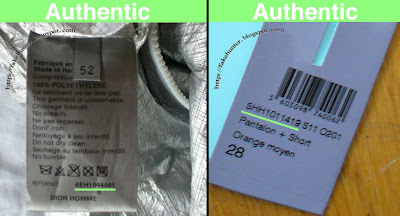 The picture on the left is of a fabric content label in a jacket. The picture on the right is the hang tag from a pair of jeans. Most fake Dior Homme has reference numbers printed in them, but they are usually incorrect for the particular item. These numbers are codes that are specific to the item's style, production year, and season. Example reference code: 5EH2022526, (which is for a blazer from the spring/summer '05 collection). '5' denotes the year it was made, in this case 2005 ('3' for 2003, '4' for 2004, etc). 'E' refers to the season/collection the piece is from. 'E' = Eté (Summer), or 'H' = Hiver (Winter). 'H' , the third character in the code, seems to refer to the specifics of the piece. I believe 'H' is for Homme, where as an 'F' would be for Femme which would be the limited petiet sizes Dior Homme has made for women. There is also sometimes a number instead of a letter for the third character, and this I believe may represent a pre-production or special order piece (but that's just a guess). '202' refers to the item group, in this case a blazer (Veste). If the number is in the 200's, ie. '202' on a blazer, I believe it denotes the material, '202' for super 200's wool vs. '102' for a blazer made with super 100's wool. Other examples: 101 = trousers (pantalon), 105 = shirts (Chemise), etc. There are many variations of these numbers for different seasons and pieces. You could probably write a book on them. '2526' deals with the cut/style of the piece. 'E47' is the fabric code, which denotes the material used. 'B6A8', is the color code. In this case, 'B' refers to Bleu (blue). If you are bidding on an online auction it's a good idea to learn what season and year the piece is from. Then, you can cross reference it with the number. The fakes are often marked with the wrong season and collection so keep an eye out. If you are not sure, do a little research. A simple Google search of the reference number may turn up some information. Men.style.com has a nice selection of runway photos from the last few years. And, if it is from a current or recently past collection, Diabro.net lists the reference number (item code) for every Dior piece it sells. You could also post a question on The Fake Hunter Discussion Forum and I or another member will try to help you.